I love catching up with old friends. But it&apos;s gotten to be a challenge, as many of us are scattered up and down the East and West Coasts. When the holidays approach it gets easier, as we return to our hometown, although now instead of congregating at a local bar, we meet at various homes, surrounded by children, spouses, and parents. Many of my friends&apos; parents are long-time powerboaters, and for most of the night, I&apos;m cornered. They all want to talk about the same thing: a comfortable, well-appointed cruiser aboard which they can retire that&apos;s capable of handling the open ocean. They throw out one manufacturer&apos;s name after another before I can comment. And these Baby Boomers are serious—they have the enthusiasm and the spending power to realize their dreams. It was just these folks who came to mind on the eve of my sea trial of the Outer Reef 73: boaters who want a yacht built to handle challenging offshore conditions. And it appeared the weather—a sustained 20-knot wind that had the flags outside stiff and forecasts calling for thunderstorms—was going to offer me the chance to see if the 73 qualified. Based solely on her construction, I suspected that she would. 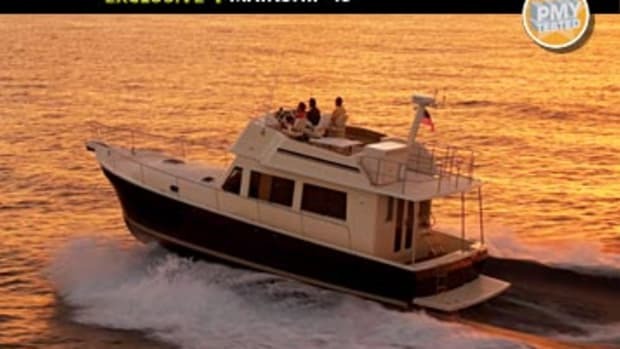 The 73&apos;s built to American Bureau of Shipping (ABS) standards for pleasurecraft and for A-rated ocean conditions, which means 18- to 20-foot seas and sustained winds more than 40 knots. 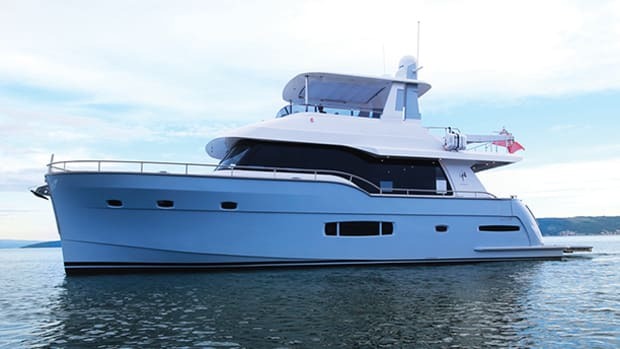 Her three-piece build (hull, deck and house, and flying bridge) is solid: The deck is through-bolted to the hull every six inches and further secured with 3M 5200 marine adhesive and multiple layers of fiberglass lamination. The hull is solid fiberglass from the keel to six inches above the waterline, averages two inches thick, and is vacuum-bagged to ensure an ideal resin-to-fiberglass ratio. Full-length longitudinal and athwartship stringers further enhance her stiffness. 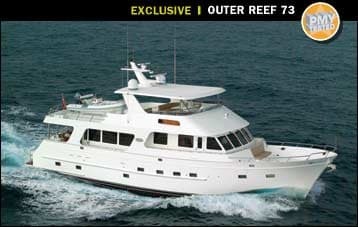 Disappointment set in the next morning as Outer Reef sales executive Mike Schlichtig whisked me to Hull No. 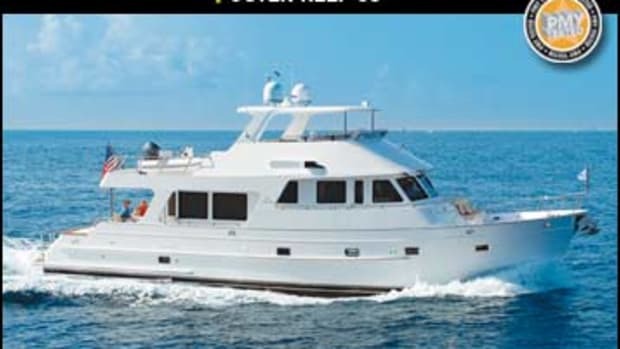 1, Sea Star, at a private quay in Fort Lauderdale, Florida. The sun was shining, and the wind had laid down. But after a few hours in the two-foot seas the Atlantic Ocean offered up, one thing did become clear: This boat is agile. 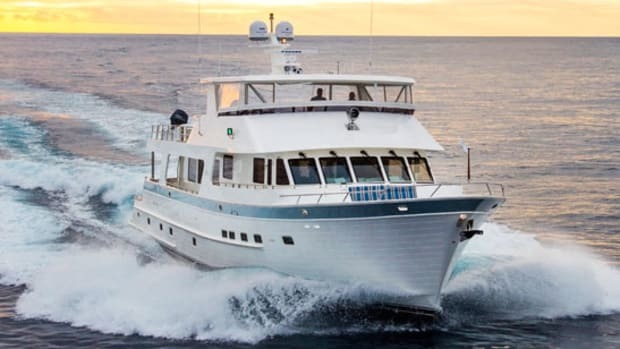 Full-speed 180-degree turns took about three boat lengths, and the 73 responded quickly to the Hynautic hydraulic steering as she gracefully weaved through the traffic in Port Everglades Inlet. The combination of hard chines and flat aft sections helped her to get on plane quickly: From a standstill Sea Star&apos;s optional twin 1,015-mhp Caterpillars propelled her to an average top speed of 19 mph in less than 20 seconds. When I backed her off to 1500 rpm (13.7 mph), she tracked superbly. I took my hands off the wheel for a full minute, and she stayed right on course. Sightlines from the flying bridge were excellent except aft; the standard 14-foot Novurania RIB and cockpit overhang blocked my view of her stern. An aft-mounted camera, viewable on the Northstar 6000i chartplotter, is available, as is a docking station in the cockpit, equipped with controls for the standard hydraulic American Bow Thruster bow and stern thrusters. 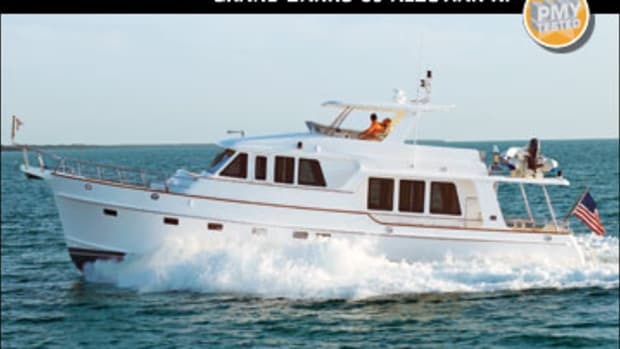 I was having such a good time maneuvering her, I was tempted to kick on the standard Simrad AP25 autopilot, throttle her back to 1250 rpm (12 mph), and set a course for Aruba; with a 2,134-mile range at this speed, she&apos;d have made it with fuel to spare. Also noteworthy was her quietness: At 1000 rpm I took a reading of 66 dB-A on the flying bridge, just one dB-A above the level of normal conversation, and at WOT sound levels there increased to only 78 dB-A. After a visit to the engine room—accessible via a watertight door from the aft captain&apos;s quarters—I believe that the multiple layers of Soundown insulation on the bulkheads and headliners here, as well as the soft Evolution anti-vibration engine and genset mounting systems, played a large role, as did the underwater exhaust. For comparison, I gathered decibel readings at her lower helm: 58 dB-A at idle and 72 dB-A at WOT. After docking, I spent more time at the lower helm. Just aft of the handsome, ostrich-skin-finished instrument panel was a comfortable, C-shape settee with teak dining table that&apos;ll easily accommodate eight. Infinity speakers here are wired to the saloon&apos;s Denon stereo system (audio-visual components such as the stereo and LCD TVs onboard the 73 are optional but wisely pre-wired). And nearly within arm&apos;s reach, just aft and to starboard of the settee, are an ice maker, 46-bottle wine cooler, and a 4.9-cubic-foot refrigerator, all manufactured by Sub-Zero. 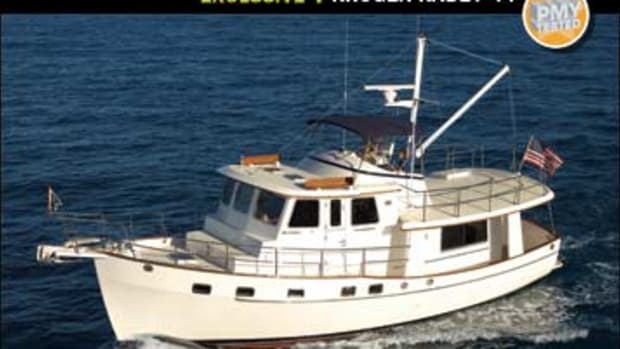 They&apos;re set off with a handsome granite countertop that matches the galley&apos;s bar top, just across and separated from the helm area by a bulkhead. One step down and aft, the saloon was just as inviting. I could easily have drawn the blinds on the six, 3&apos;8"Lx2&apos;10"W windows and turned on the 32-inch Sharp Aquos LCD TV and standard KVH TracVision satellite TV system. 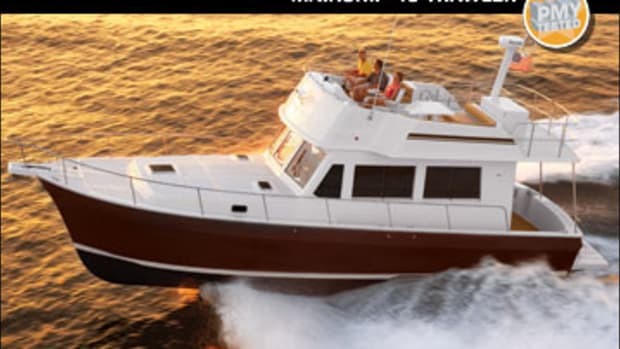 Sea Star&apos;s owners chose an optional cherry interior instead of the standard teak. In most areas the finish work was superb, with lovely joiner work and grain matching. But some surfaces—the rounded bulkhead near the saloon doors in particular—felt bumpy. Also, a few spots on stateroom bulkheads had inconsistent gloss. 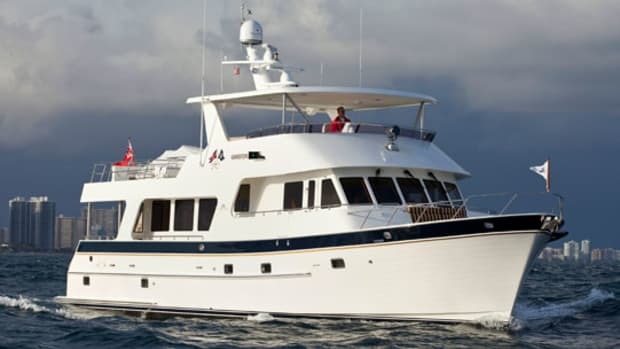 Otherwise, the Outer Reef 73 shone: She&apos;s a lively performer with long legs, and with three staterooms and a convertible settee in the saloon, she provides accommodations for eight plus a captain. And the 73 displayed nearly all of the qualities that my friends&apos; parents had grilled me about. 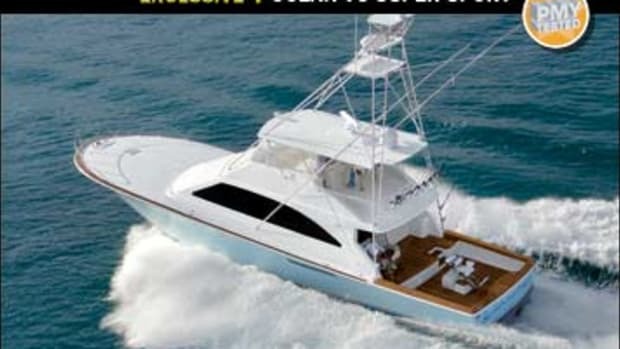 So if they&apos;re willing to put her to the test in an Atlantic-to-Pacific trip via the Panama Canal, I have friends I need to see along both coasts. 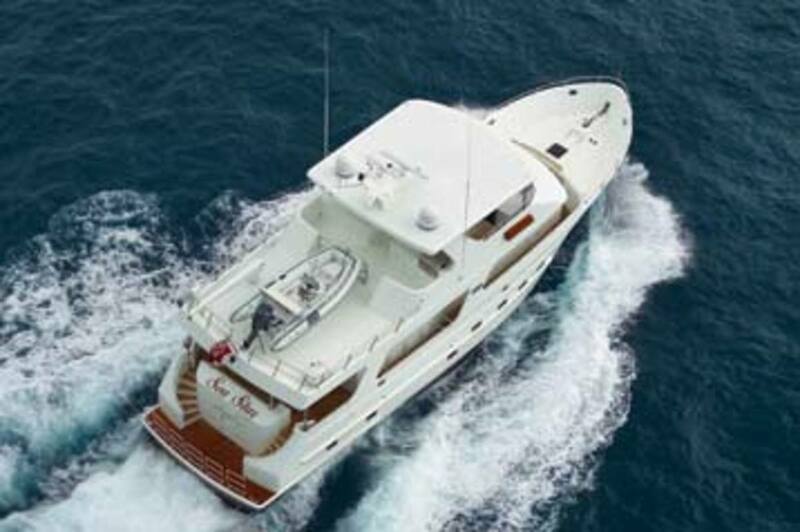 For more information on Outer Reef Yachts, including contact information, click here.